How to host more than one participant in your calendar event! In this article we will set up a group bookings project. Group bookings projects are excellent for arranging classes or seminars since we allow many people to book 'seats' for a single slot with a single resource, the resource being the teacher or lecturer in this case. This is why we call it: "Many to 1". 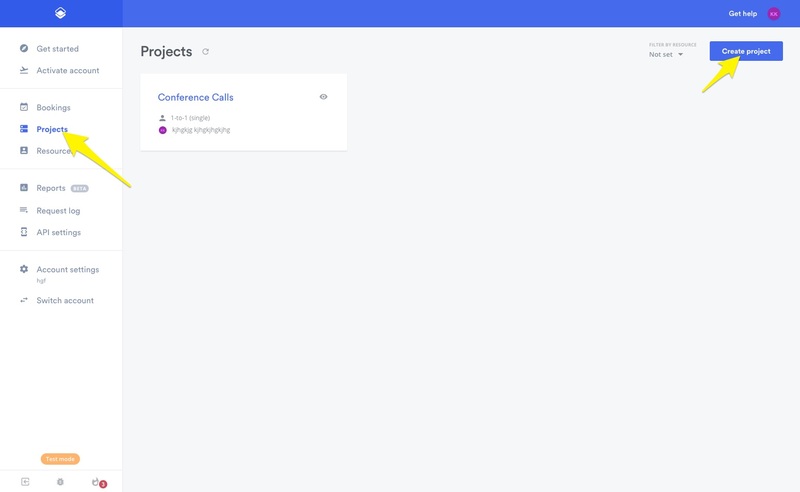 Navigate to the Projects page by pressing the Projects link in your left sidebar, once this is done, you can create a new project by pressing the top right 'Create project' button. 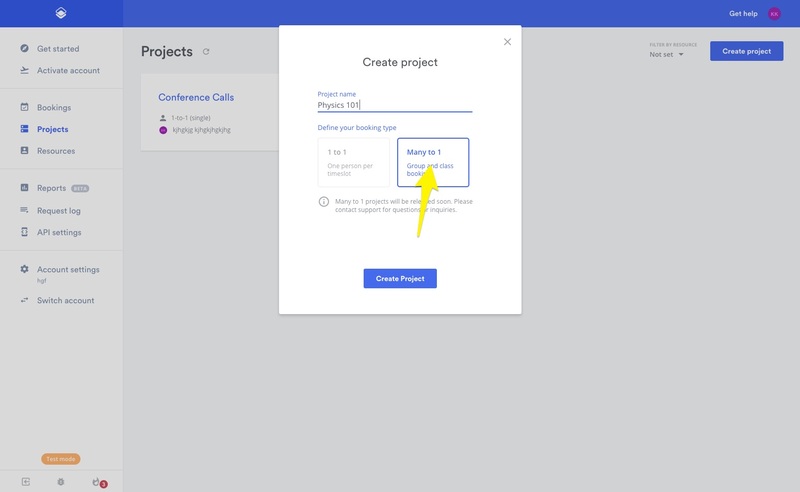 Pick the 'Many to 1' option and give the project a fitting name to make it easy for you to navigate your dashboard. 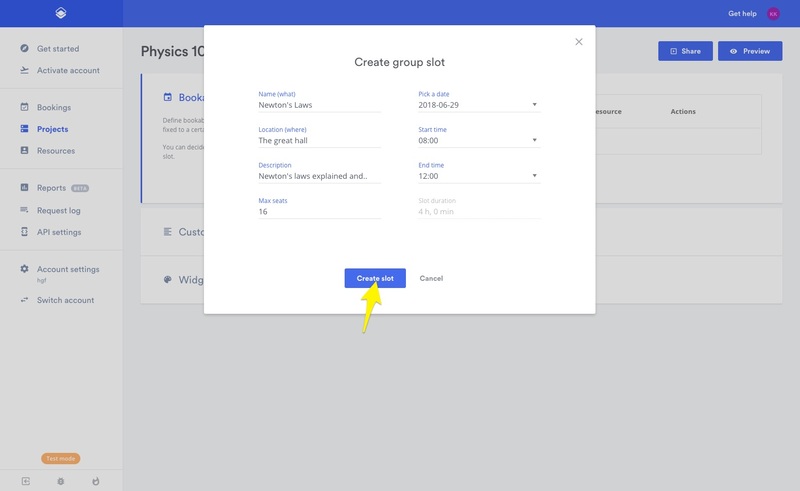 Click the create button and you have now created your shiny new group booking project. This project works a lot like your other 1-yo-1 projects. There difference is how you set up your availability. 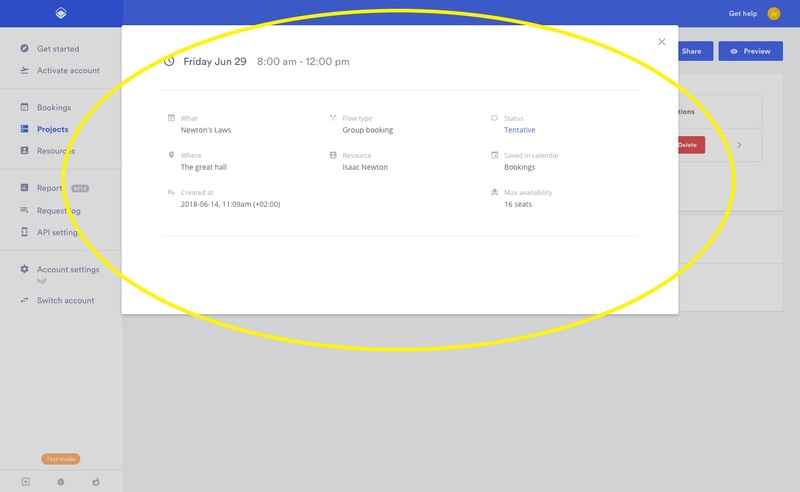 A group booking does not have any open slots by default. You have to create the slots yourself. Let us create one together! 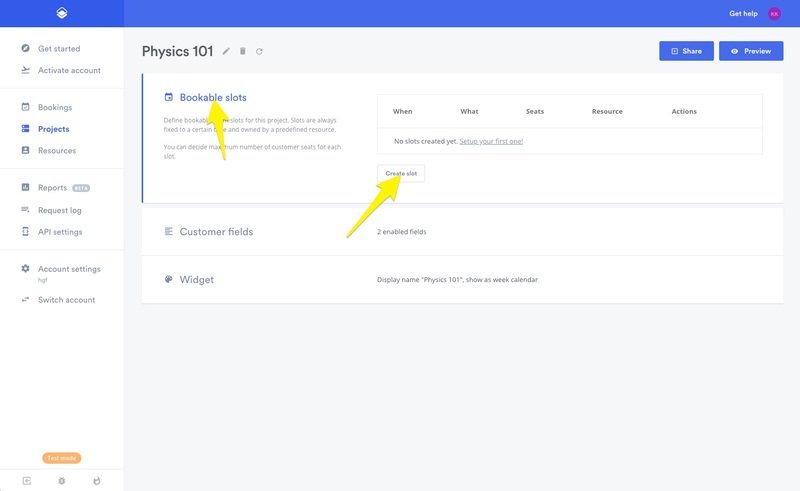 Start by pressing "bookable slots" row, followed by clicking the "Create slot" button. This will open up details to your group booking slot. In this case, I am going to be lecturing on physics, namely, Newtons laws. Since I dont want too many people, I will say a maximum of 16 seats. Once you have filled in all the required fields, press the "create" button. Fantastic! You have now created an available slot, and before you know it, your new students will start pouring in. 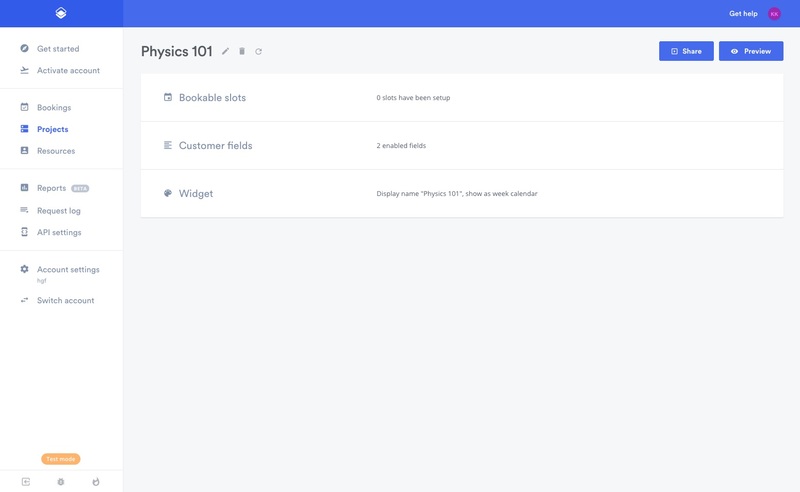 As you can see in the next screenshot, we now have a new slot in our Booking slots overview. The bookable slots lets you see who has taken a seat, and lets you manage them via the booking card. If you press your booking slot, you will be able to see the details of this particular booking slot. Finally, close the card details and press the "Preview" button in the top right. You will be able to see only 1 slot currently, the one we made previously. 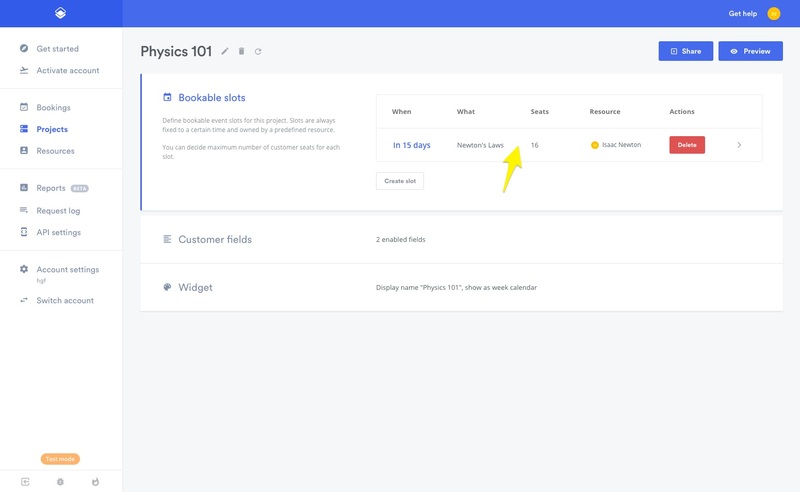 This is because only the Bookable slots that we create ourselves will appear in the booking widget, as mentioned earlier. 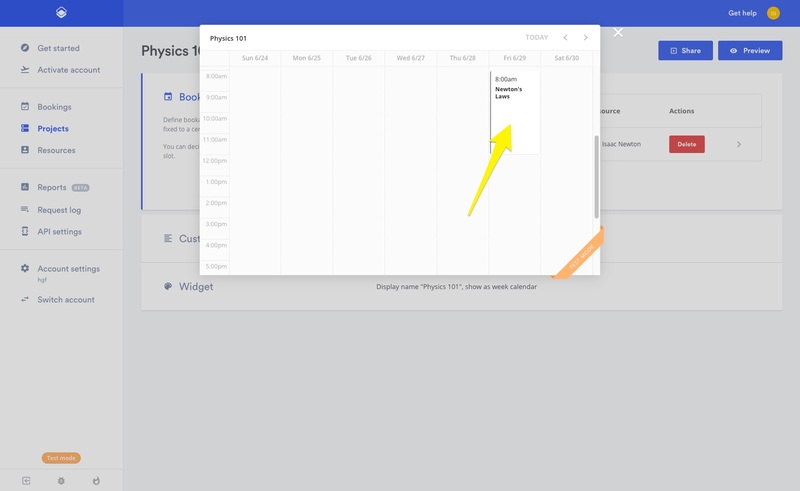 If a time slot/event is fully booked, it will no longer be visible in your project widget. However, should a participant cancels his or her seat, the event will automatically re-open for new entries until the class is once again, fully booked.